If you’re familiar with the tech industry, you’re probably aware that Chinese device maker Huawei is also in the business of producing its own silicone chips, known as the HiSilicon Kirin. Even if Huawei’s SoCs aren’t so well known as Qualcomm’s, MediaTek’s or Intel’s chips, they are slowly starting to gain more spotlight. Recent rumors claim that the next-gen Nexus phone will probably end up being built by Huawei, who will put one of its chips inside to power everything onboard. The company’s HiSilicone Kirin 930 is currently powering the device maker’s flagship models, but Huawei has plans to soon roll out the successor of this silicone architecture. As a matter of fact, the first details related to the next-gen Kirin 940 and Kirin 950 have already surfaced online, showing us what we should expect. The Kirin 940 is poised to arrive in Q3 2015, while the Kirin 950 will be launched in the fourth quarter of the year. Both these models are octa-core affairs featuring a quad-core Cortex A53 plus quad-core Cortex A72 setup. Both models will support dual-channel LPDDR4 RAM (25.6GB/s) memory and 4K video encoding and should arrive with Tensilica HiFi 4 DSP (highly optimized audio/voice chip geared for efficient execution of audio and voice codecs). 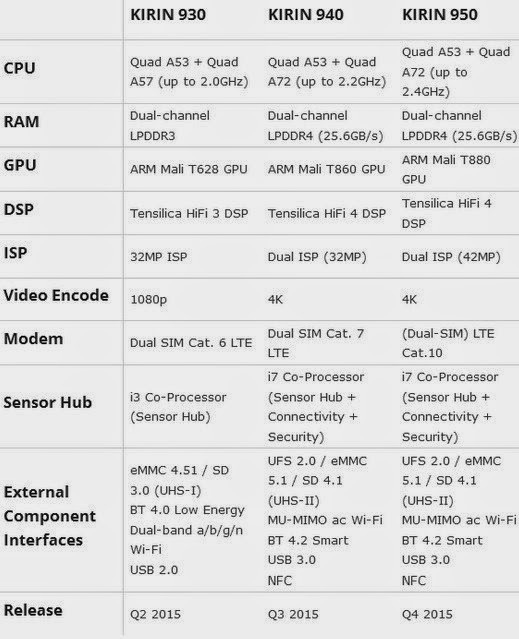 The two chips will come with i7 co-processor (sensor hub + connectivity + security). The Kirin 940 will be outfitted with ARM Mali T860 GPU, while the Kirin 950 will be bundled with ARM’s Mali T880 GPU. The first model will receive 7 LTE connectivity support, while the higher-end 950 will support dual-SIM cat.10 LTE connectivity. The Kirin 940 is supposed to be the next step over the current Kirin 930, while the Kirin 950 will come with slight modifications, but will be the more premium model. It’s interesting to note that one of these two chips might as well end up powering the next Nexus smartphone. The handset is poised to make a debut sometime in the second part of the year and Google will probably talk about it at its I/O conference this summer, but will actually release the device at a later date.